The build-up was immense. Head to head skiing. 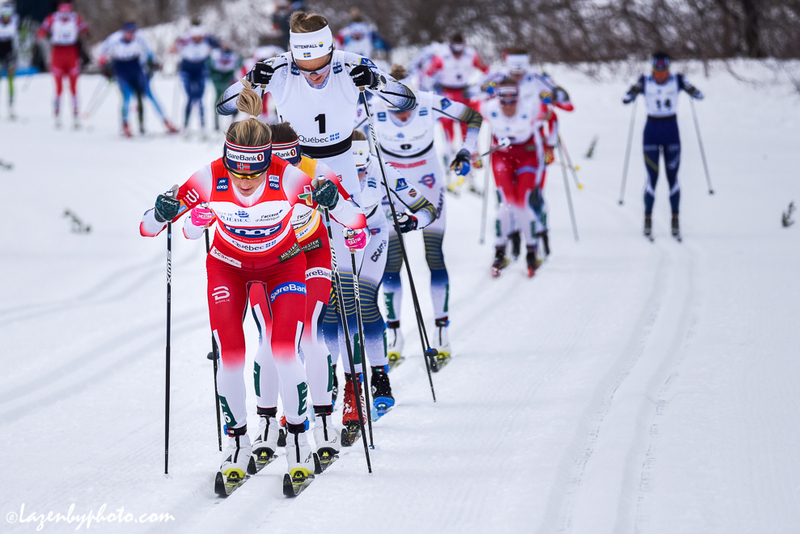 A mass start classic race with 10-kilometers to prove world-class stamina with Québec City’s cross-country ski fans lining the course. In a world now rife with data and the application of that information enmeshed in sport, the calculus seemed simple enough. Norway’s Therese Johaug has made a clean sweep of every World Cup distance race she’s entered this season. Nine World Cup wins. Then add three distance wins from the 2019 World Championships. A flawless resume when the kilometers extend beyond sprint-mode. A key piece of information one could apply to Saturday’s race was the final kilometer in the women’s 4 x 5 k relay at World Champs. If you haven’t watched, go take a few minutes. It’s downright worthy of your time. Here’s a link. It’s broadcast in Swedish but you don’t need to understand that language to possess fluency in the universality of stoke. Fast forward to the video’s 53:56 mark. This is when the good stuff goes down. It ends at 57:00. But so worth the four-minute Nilsson-Johaug duel. Take a breath. Now, before we get to the ending moments of Saturday’s 10 k race, let’s dial it back again. Nilsson skied in bib 1 as yesterday’s skate sprint winner. But Nilsson has distance tricks up her sleeve too. Her World Cup distance results are sparingly peppered with top-threes. She won bronze in last year’s Olympic 30 k mass start classic along with her gold in the 2018 Olympic classic sprint. In bib 26, Johaug hurridly skied towards the front after the start. By 1.6 k she was in ninth, less than two seconds from the lead. With the kilometers ticking down, and the big-World Cup snow globe shaken up, Johaug was the pace-setting agitator making sure those in her wake settled further and further back. The time splits back were never the usual Johaug-massive — she’s been known to decimate world-class fields. Yet, on the open course, with no forest to hide distance back to the front group, the gaps began to look insurmountable for many. A front quartet defined the sharp end. 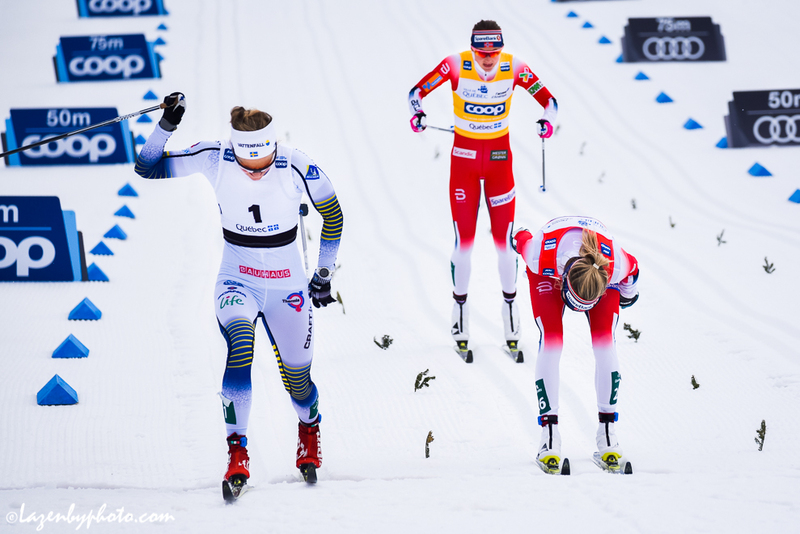 By 5.7 k Johaug, Nilsson, Norway’s Ingvild Flugstad Østberg, and Sweden’s Maja Dahlqvist were fighting for the podium. Although having only an eight-second buffer on a chase-train many skiers deep, the pace of the front four was unmatchable. Between 7 and 8 k, with Dahlqvist looking like a possible pacing casualty as Johaug drove on, the Swede snapped a pole and dropped back. The eventual podium skiers never blinked as they scorched ahead. 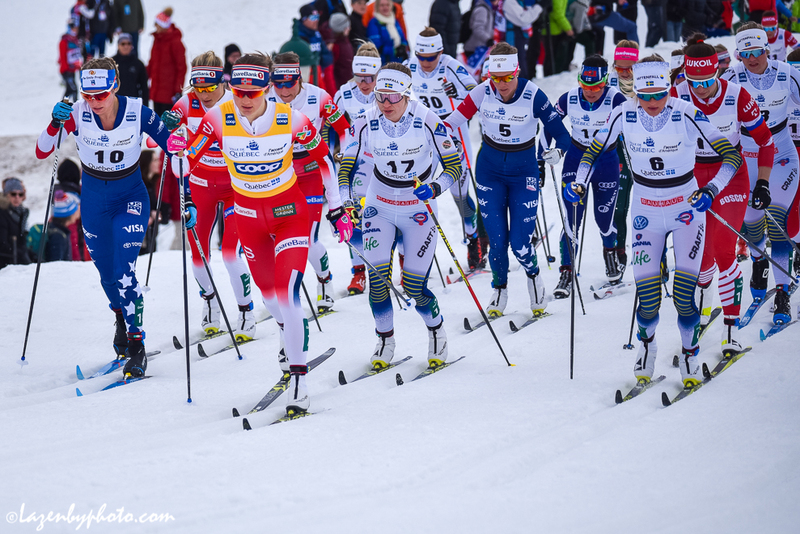 With a kilometer remaining, Johaug, Nilsson, and Østberg had a twenty-second cushion on Finland’s Krista Pärmäkoski and Sweden’s Ebba Andersson. With no real pressure coming from the back, Johaug did her best to shake off Nilsson and Østberg. Johaug charged the final hill, pushed over the top, and gained a several meter gap. But the lead was marginal considering Nilsson knew a finishing straight sprint would play in her favor. Rounding the 180-turn into the straight, Nilsson was locked on Johaug and went to a wider lane to put down her kill-shot double pole. But it was close. This was no Johaug fade-to-the-back sprint finish. Nilsson won in 25:51.6, Johaug placed second (+0.2), and Østberg third. “It feels really good today and I really like the conditions where I can use my upper body almost all the time, it suits me really good,” Nilsson told FIS after the race. 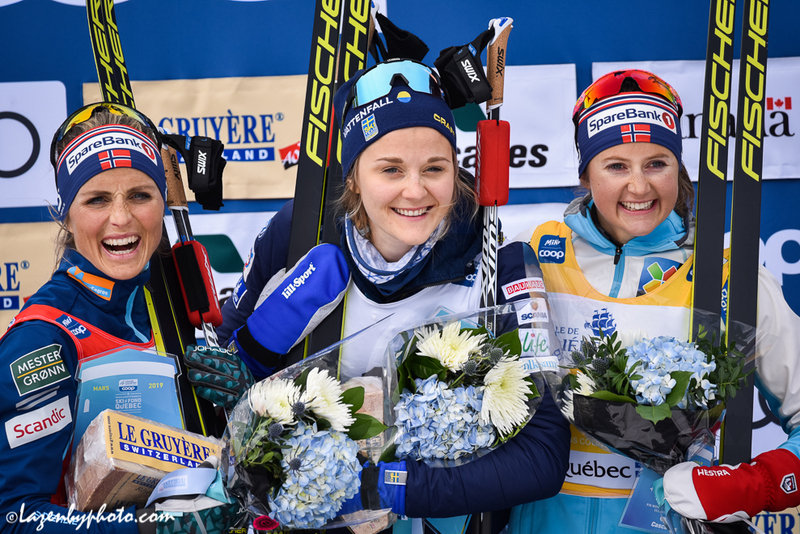 “My plan was to go for the bonus seconds then to go as fast as I could for the rest of the race and I didn’t expect to be to the finish line with Theresa but I am so happy that I did,” Nilsson added. Her tactics were a waiting game and to optimize her strengths. That gap was obviously closed down. 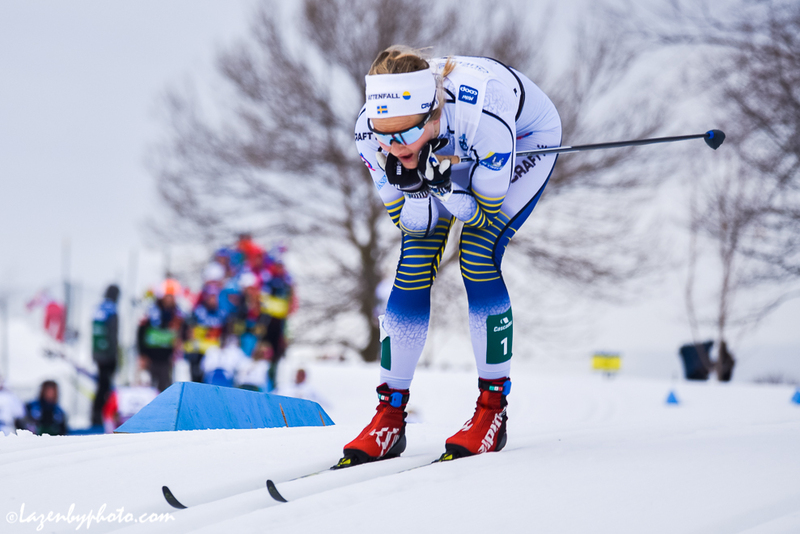 Despite her own confidence, Johaug understands her limitations against Nilsson. But haunted twice now in recent weeks by a Nilsson double pole effort in the closing moments of a distance race, Johaug said she knows how to improve. 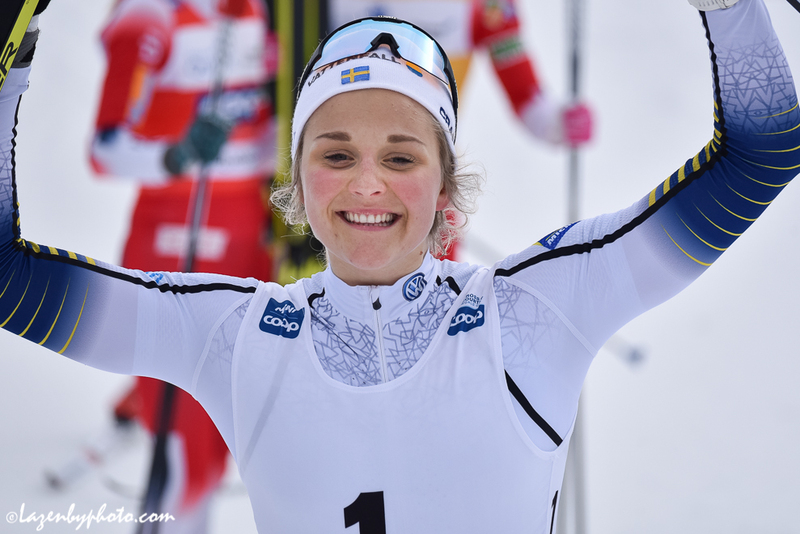 Johaug has already secured the overall distance World Cup crystal globe. It is her third distance title after winning in 2013-2014 and 2015-2016. Østberg’s third-place on Saturday had more relevance for the overall World Cup standings. Prior to the Québec City races, Østberg held a 97 point lead over Russia’s Natalia Nepreyaeva in second place. Nepryaeva struggled on Saturday to keep pace and remain firmly on her skis. She placed 12th and now sits 144 points behind Østberg. Sadie Bjornsen of the U.S. Ski Team (USST) was the best placed North American. Starting in bib 5, Bjornsen slowly dropped off the redline pace of the front skiers. After 10 k, skied across the line 1:03.2 behind in sixth. Bjornsen’s skiing at the end of a European based grind remains on form. Her sixth place in Friday’s skate sprint — during which she made a crazy hard recovery in her semi — reinforced her race sensations. On Saturday, her time losses were minimized by fitness as she was noted to be slipping on several hills. Jessie Diggins placed 29th, 1:24 back. It was a race where she too fell and struggled with tough-to-kick skis. With the race happenings documented, dialing the lens back gives a better picture of where things sit for tomorrow’s final stage pursuit. With time bonuses factored in, Nilsson leads after two stages with an overall time of 28:17.4 minutes. She’ll be the first skier out for tomorrow’s 10 k skate pursuit. Østberg, who placed eighth in the sprint coupled with her third place today will ski off in second, 33.2 seconds back. Johaug will be released third with a 49.4-second deficit. Bjornsen is seeded 10th overall. At 1:47 behind, she’ll have plenty of fast company to hunt places. Sweden’s Frida Karlsson is ninth (+1:37.1) and Charlotte Kalla, also from Sweden, is 11th (+1:48.3). After two stages, Diggins is 23rd overall (+2:18.8). Sophie Caldwell remains in top-30 contention with a combined 7th in the sprint and 37th in the mass start to be seated 31st (+2:41.4).